Phil Ring, Larisa Love and Ricardo Santiago with models from all three segments of the Joi-Color Your World presentation. The Event: In its first year as an international event (it had been a retreat exclusively for Joico Canada), Joico’s Global Destination Education invited guests to Punta Cana, Dominican Republic for a week-long retreat consisting of education, parties on the beach, poolside scavenger hunts, and getting up close and personal to big-name stylists from around the world. A packed room of attendees during education. The Details: For any company holding a massive retreat like this one, the perfect formula is one that consists of a perfect balance of networking, fun and learning. If that cocktail is achieved, endless energy and open-mindedness by guests make it next-level. That was absolutely the case for Joico GDE 2018. Lo Wheeler and Olivia Smalley during the pool-side social media scavenger hunt. 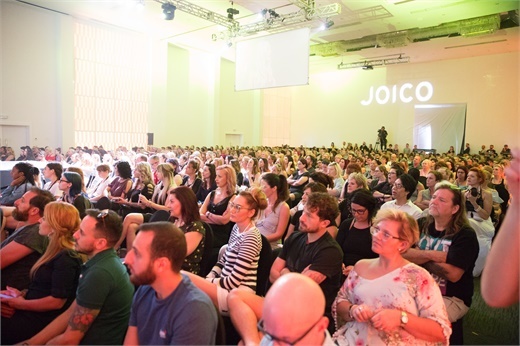 Destination Education was the brainchild of Joico Canada, with three retreats taking place in 2012, 2014 and 2016. They pushed to turn it into an international endeavor. As the first-ever Global Destination Education, the “joi” mantra of Joico resonated through every aspect of the trip. One thousand attendees representing 28 countries shared passion and excitement in everything from classes, to runway shows, to beach parties and more. 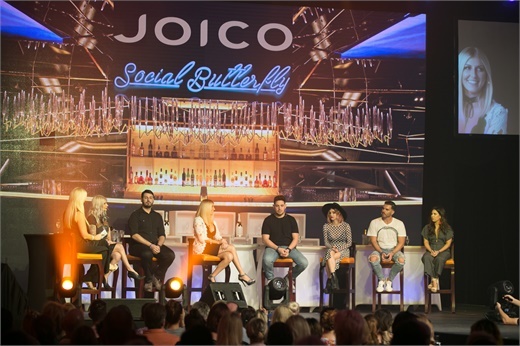 All-Star Stylists: Joico brought together a group of diverse industry experts to inspire, motivate and meet with guests. Joi-Color Your World, emceeded by Joico Guest Artist Ben Mollin, included looks and techniques from various Joico ranges: Vero K-Pak Color, led by David Murray and Ryan Nicoletti-Dowd; Lumishine with Joico Celebrity Colorist Denis de Souza, Joico Guest Artist-Canada Melissa Duguay, and Joico Guest Artist Zöe Carpenter, who showcased shiny and healthy, ready-to-wear color looks in a soft red, a sun-kissed sombré and a beautiful blonde; and Color Intensity, creative-color tips and tricks led by Phil Ring, Larisa Love and Ricardo Santiago. 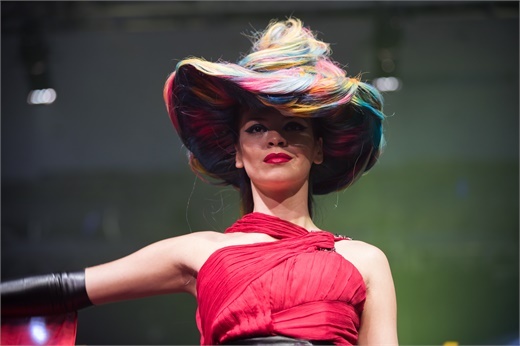 Industry icon Vivienne Mackinder challenged guests early on to unlock their creativity. She says artists can’t give what they don’t have, and the purpose of the week is for artists to give back to themselves and reignite their spark. Other hair-presentation highlights included a lesson in balayage with the queen herself, Amber O’Hara, a beautiful braid presentation from Jenny Strebe, cutting and styling techniques with Richard Mannah, and an electrifying Fashion Rocks presentation and party, complete with a lip sync battle and on-stage pyrotechnics. Social Butterfly: The Social + Celebrity panel was a chance to hear first-hand from artists about their careers paths and successes. The panel, moderated by Valerie Robinett, was comprised ofLove, Strebe, de Souza, Santiago, Ring, Olivia Smalley and Marissa Marino, who shared insight on how they made it big in their respective lanes. Valerie Robinett moderates the Social + Celebrity panel with Jenny Strebe, Phil Ring, Olivia Smalley, Ricardo Santiago, Larisa Love, Denis de Souza and Marisa Marino. The panel brought that sentiment to fruition during the event on social media, following each other and practicing what they preached. The Final Word: “A company is not the product; what makes it special is its people and the people who support it,” Jones said. One of the many awe-inspiring hair looks during the week. Stay tuned for information on the next GDE, set for 2020.